“Choosing from many bounties, the Divine Intelligence had bestowed upon Mortals the gift of Harmony. The Violin fell to the Italians, the Flute to the Germans, the Harpsichord to the English, and the Bass Viol to the French.” Hubert le Blanc (1740). 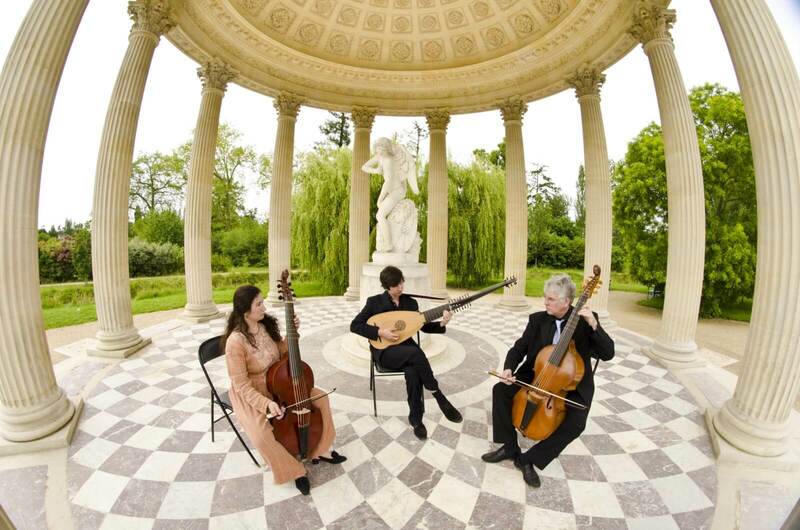 The infatuation of the French for the bass viol naturally spreads to Versailles where the Sun King, a keen music lover, is always escorted by two viol players from among the “ordinaires de la chambre du Roi”. Today’s two programmes are built around those two musicians. Robert de Visée, together guitarist, lutenist and theorbist, stands out both as instrumentalist and composer. He belongs to the close circle of musicians allowed in the royal bedchamber and is eventually appointed Guitar Master to the king. Of even greater renown today, Marin Marais studies bass viol with Sainte Colombe and composition with Lully. Appointed “Ordinaire de la chambre du Roi” as viol player in 1679, he spends most of his life in the service of Louis XIV. This concert will offer us an interpretation closest to what Marin Marais precisely had in mind when composing his works, based as it is on a manuscript, unexpectedly discovered in 2018, in which all the aspects of his specific play – articulations, dynamics, and bow strokes – are recorded. A new lease of life for this extraordinary composer. The ensemble was born in 1985 from the passion Jonathan Dunford and Sylvia Abramowicz shared for the viola da gamba. American by birth, French by adoption, Jonathan Dunford trains under Jordi Savall, then decides to devote his musical career to the bass viol. His extensive research in libraries the world over breathes new life into a number of long-forgotten works for viol. To this end, he publishes articles in music magazines, or hosts radio broadcasts and masterclasses. He also performs within various ensembles, playing an eclectic repertoire: Renaissance music, Elizabethan pieces, Baroque works, Chinese music or Arab music, and even improvisations on an electric viol with guitarist Fred Frith. Attracted from the start by Early music, Sylvia Abramowicz, also, trains under Jordi Savall. She is invited to perform with the most illustrious ensembles devoted to this repertoire : Centre de Musique Baroque de Versailles, Le Poème Harmonique, Akademia, Doulce Mémoire, Les Arts Florissants, Les Folies Françoises, Les Paladins, the Collegium Vocal Gent… with which she makes some fifty recordings. When he first came to Valloire in 2012, Thomas Dunford was starting out on a brilliant career. Dubbed “the Eric Clapton of the lute” by BBC Magazine, he is back this year, together with Jonathan Dunford and Sylvia Abramowicz, to form the Trio Dunford whose closeness is only too easily understood. In 2012, his first solo CD, unanimously acclaimed by critics, is awarded a Prix Cecilia. Labirinto d’Amore, his second CD, receives a “Choc”, from Classica, as does his latest solo album dedicated to Johann Sebastian Bach. A CD around Vivaldi is due to be released in 2019. The biography of Gaël de Kerret, speaker of the Libre cours lecture “The Arts at Versailles”, can be found by following this link.